Western blot analysis of whole cell lysates probed with EIF2S1 antibody (VMA00134) followed by detection with HRP conjugated Goat anti Mouse IgG (1/10,000, STAR207P) and visualized on the ChemiDoc™ MP with 60 second exposure. Arrow points to EIF2S1 (molecular weight 36 kDa). EIF2S1 antibody recognizes eukaryotic translation initiation factor 2 subunit 1, also known as eIF-2-alpha or eukaryotic translation initiation factor 2 subunit alpha. This antibody has been extensively validated for western blotting using whole cell lysates. Mouse anti Human EIF2S1 antibody recognizes EIF2S1, also known as eIF-2-alpha, eukaryotic translation initiation factor 2 subunit 1 and eukaryotic translation initiation factor 2 subunit alpha. The translation initiation factor EIF2 catalyzes the first regulated step of protein synthesis initiation, promoting the binding of the initiator tRNA to 40S ribosomal subunits. Binding occurs as a ternary complex of methionyl-tRNA, EIF2, and GTP. EIF2 is composed of 3 nonidentical subunits, the 36 kDa EIF2-alpha subunit (EIF2S1), the 38-kD EIF2-beta subunit (EIF2S2), and the 52-kD EIF2-gamma subunit (EIF2S3). The rate of formation of the ternary complex is modulated by the phosphorylation state of EIF2-alpha (Ernst et al. 1987). 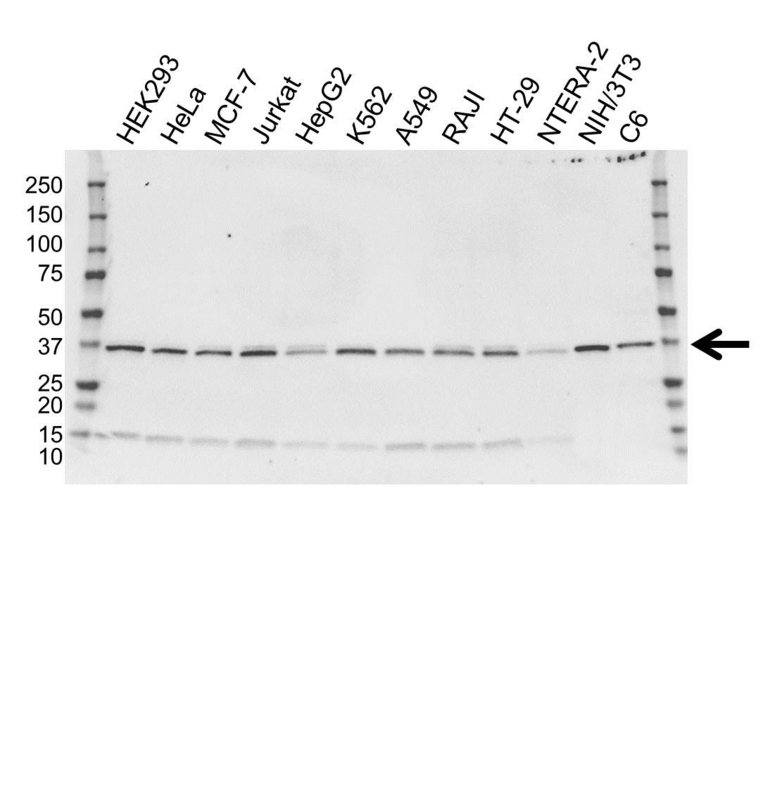 Mouse anti Human EIF2S1 antibody detects a band of 36 kDa. The antibody has been extensively validated for western blotting using whole cell lysates. Anti EIF2S1 detects a band of approximately 36 kDa in HEK293 cell lysates.